Hello everyone. I’ve <a href="/viewtopic.php?t=10161">talked about it in the past</a>, but now it is finally happening. I’m going to open up a public tool for editing information in the Kongming’s Archives database and we’re going to see if we can start evolving it into an interactive online encyclopedia. This could also mean things like online community biographies, new information and areas at the main site, or easy collaboration on projects like ‘Differences Between the Novel and History’ lists. We just need people interested in working on the project and turning it into something cool. To that end, if you like the idea of a Three Kingdoms reference on this scale, want to contribute to Kongming’s Archives, or simply want to share your knowledge with others, reply in this thread and let me know (include the information below). If you would like to participate in the Development Project, please fill out the form listed below. You will need a Kongming’s Archives user account to join. We will write you back after you submit it and soon you can be editing Kongming’s Archives over the internet! Feedback, ideas, questions, and comments are more than welcome in this thread. If you want to read more, please reference the second post. Last edited by James on Fri Jan 05, 2007 2:24 am, edited 2 times in total. I would like to introduce the foundation of what, with participation, could turn into the Kongming’s Archives community encyclopedia. Some time ago, in this forum, we talked about the relatively new Kongming’s Archives database and the possible future of a member-based <a href="/viewtopic.php?t=10161">Three Kingdoms Encyclopedia</a>. The role of Kongming’s Archives’ database has been gradually becoming a greater part of the site, and now I’m even having more wonderful ideas for its possible future. The Hanzi, Biography, Style Name, and other projects are all based off the information in this database, and some of the possibilities for the future include, now realistically, the encyclopedia talked about in that older thread, and other things like community biographies. This is where you come in. Some basic information used at Kongming’s Archives (specifically mini-biographies, lifespans, kingdoms served, and very soon, Hanzi) has all been made available through a new community tool. 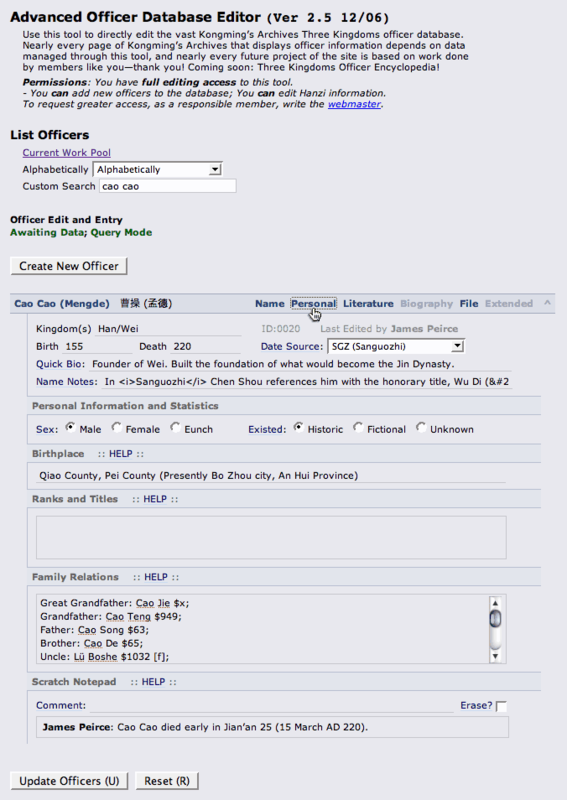 It allows you to bring up collections of officers at once, edit information for as many as you like, then update all the information in real-time to the Kongming’s Archives site. 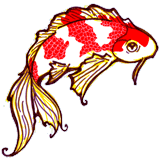 Changes are reflected on the site immediately. Down the road any information you could imagine can be added to tools, and it could result in a community maintained and update searchable encyclopedia of Three Kingdoms officers (not to mention battles, kingdoms, locations, etc.). I think anyone here can probably imagine the potential of something like this—it certainly exceeds anything any one of us might be able to do on our own. Today though? We’ve got to start somewhere, and this is that place. With so much authority over content on our site, strong security measures and program reliability have to be developed, and I’ve already done about everything I can without public use for additional testing. Now I’m looking for people that want to help with the project, are interested in seeing something like this happen or being a part of it, or simply want to contribute good information to our site. If things go well, and people participate, I’ll keep adding tools as we gradually work toward the possibility of a full, searchable, and more reliable, Three Kingdoms Encyclopedia. Here are some pictures of the new tool. The information editor supports advanced searching (the same engine used elsewhere on the site), which supports everything from smart searching (e.g. it will recognize names like A-Man, Xian Di, and alternate spellings [e.g. Liu Chan/Shan]) to regular expressions (which I’ll write a basic guide for). It then brings up all the requested officers and lets you edit information as you please, only updating what you have requested. It also remembers who made the last changes were made by. Log in and out using your Kongming’s Archives user account. Access is managed through special permissions set in your Kongming’s Archives user account (which was previously only used for the Three Kingdoms Quiz). In the future, that user account will be used to govern other elements of the site such as the game and music downloads sections, or perhaps even a FAQ, Fan Art, or Fan Fiction contribution manager (the later mentions not presently planned updates). If you want access, or what your permissions changed, all you have to do is ask! Very soon I’ll be creating a new account page for the whole entire site so you don’t have to sign up in the Quiz page. (For the moment, accounts can be created manually). The chief concern behind opening the Kongming’s Archives database to other members is making sure contributed information doesn’t cause problems, while protecting the integrity of the site. The tool is smart enough to update most of the content it receives to site standards (e.g. curly quotes, placement and use of ‘AD’, em and en dashes) while also making sure the tools aren’t abused (if vulgar language is used, for example, the tool will terminate a user account on the spot). If you would like to participate in this new project, all you have to do is let me know what user account you would like activated. Post in this thread or PM me with the details (and make sure you let me know if you want certain rights like Hanzi editing) and I’ll write you back with the necessary information. If you don’t have an account, send me a User Name, Password, Email Address, and, if you like, your affiliation (used for things like the quiz, defining what site you are a member of) and I’ll set it up for you. A signup and account editing page will be available online in the upcoming future. By all means, please ask or share them here. This could really turn into something cool. So what are we doing with the tool now? Our main goal is to set up the basic information for the database. We want to add kingdoms served and mini-bios to basically everyone if possible so people can search and identify them using these criteria. Mini-bios help to discern between officers that have the same names. It will also help to find possible invalid or duplicate entries in the database (sometimes, for example, name confusion results in two officer entries under different name variations). This will also give us our first chance to start creating a reliable listing of officer lifespans. Also of importance, we are looking for errors in the tool or its programming that would cause much more serious problems with more users or later when code is borrowed to other tools. Well done, I like this idea as it will allow people who do translations or catch spelling errors or something to edit...I think. If this works out it would be cool to allow trusted users perhaps to add information for games, put Dynasty Warriors artwork of their own on the site of maybe just do minor stuff like make portraits or add ones not currently on the site. Kongming's Archives has always been very expansive and I suppose with this and hosting and other stuff it can grow even bigger. But for now it will be interesting to see what the members of this site can add to make Kongming's Archives a bit better. I guess it's just a matter of time before this blooms into something great. The real idea behind the project is simply to give multiple people, anywhere on the internet, a chance to edit and update information in the Kongming’s Archives database. Down the road it could let people work on biographies together, or something else along those lines. It doesn’t do spell-checking or anything like that though. If people are writing bios or text fields they should already know that stuff. I wonder if I made the first post too complicated? I'm willing to help in any way I can. I think this idea is very good, even if it take awhile to get going. Perhaps if responses lack for another month, the above posts should be edited but I otherwise think it is fine. This is a great idea and I look forward to seeing it develop. Just a quick question: In regards to other historical information besides the personalities and battles. Will there be information about things like actual weapons used, tactics, writing, etc. from the 3K era? Books on the subject are kind of hard to find, especially considering that there is so much to read about equally dramatic and important eras. Books dealing with the Han and its armies aren't so hard to find, but I would like to find more information and even illustrations on the 3K era specifically. The encyclopedia would be a good opportunity to organize and present facts that we don't have available to us normally. I also think this is a good idea. It may be particularly useful in identifying contradictions between SGZ bios that exist at the moment and help to discover the most probable truths. I would like to be involved in this for sure. I’m glad some people are interested in the project! Dong Zhou, elitemsh, please feel free to send me an email or a PM with some basic information about what you know of the Three Kingdoms, what resources you use, and what sort of thing you would like to edit in the project. Also please do mention if you can read Chinese. After that, I’ll be happy to give out access to the section so we can see what it evolves into. If anyone else is interested, please let me know! Mistelten, it could indeed be an excellent tool for putting that sort of information together. Once the basic program is evolved more, and once people are aware of and using the project, we would be able to introduce new sections. For example, I could set up a page with an article which everyone could contribute to. That way, everyone could share their thoughts and correct other errors. It could also be used to let everyone work together on a biography, for example. Relative to the example of weapons, we could create a weapon database. People could add new weapons and update information of weapons that already exist in the database. They could submit pictures. The best part is that time could be spent adding content… not editing code. I'm more than interested. I've been wanting to get involved with the project since it started, but I never quite got around to it.